Another internet faxing provider for over 20 years, eFax claims to be the #1 online fax service providing solutions for several Fortune 500 companies. Currently it’s ahead of other services by offering virtual fax numbers in over 42 countries, therefor dominating international faxing features. While many services offer different faxing plans, eFax keeps it simple by offering 2 basic plans on their site, however you also have the option of contacting them for corporate plans for businesses that handle more than 10 employees. Nonetheless, eFax still falls within a reasonable price ranges for established businesses, home offices or even for virtual offices startups that are in search of a reliable online faxing solution. Plus, they offer international fax number which is something other providers don’t have. There is also an activation fee for eFax but it is waived if you sign up for a free trial first. eFax Pro has a fixed one-time activation fee of $19.95. Whether you sign up with a free trial or on a monthly plan, there are no contracts so your experience is risk-free. You can call at anytime to cancel. Use your Gmail account. We think this is the easiest option and you don’t have to modify any setting in your email account. Login to your Gmail account, create a new email and instead of typing in the recipients email type the fax number (including area code) with “@efaxsend.com” at the end. Use their mobile app (available for iPhone and Android). Another alternative to cell phone faxing is also accessing your email account through your phone and faxing through here like you would in the above mentioned steps but apps are also available to get access to features such as being able to electronically sign your documents. Android and iPhone fax apps always have mixed reviews. Fax directly from Microsoft Word. Now you can also download an add-on for Microsoft that allows you open an eFax window inside your Word Document to fax it directly to the recipient. Download the eFax messenger (for Windows or Mac). If you prefer to use a software from your desktop then download this to make it convenient to manage your online fax account all-in-one place without having to open up your web browser. Login to your eFax account online from a computer. Whether you are at your personal computer or away on a business trip using a different computer, your account will be accessible anywhere you go, 24/7 by logging into your password protected account. Aside from modifying your account settings here, you can also send, receive and view your stored faxes and logs. 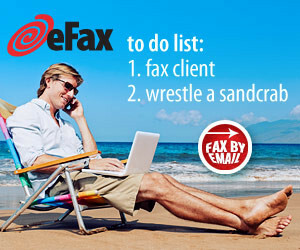 With eFax you can add up to 5 emails to your account which will allow them to also send and receive faxes online. You can also have a test fax sent to your email from their website to preview what a receiving a Gmail fax looks like. All your faxes are also stored in your online account forever, which makes it easy for you to manage and search previously faxed documents. Electronic signature is a major feature offered by eFax. This makes it easy to quickly sign documents and have them ready for faxing to seal a deal or get confidential information delivered quickly. They also offer a variety of ways to send faxes through the internet, make it a flexible tool that integrates with your business flow. Also, you can rest assured your documents are transmitted safely with their high encryption security.